LA Animal Services’ February 2009 statistics are now available. Something truly remarkable seems to be happening. Despite encountering the highest January/February impound rates in nearly a decade we were able to achieve the lowest January/February euthanasia rate in the department’s recorded history. And this was done without overcrowding our Centers! This is a tribute to all our employees, volunteers and partners! Well done! Thank you for all your efforts! So how did this happen? From lessons learned! Over the past two years, LA Animal Services experienced the largest, fastest, most historic growth in service demand in its history. With the opening of our new and expanded Centers we experienced nearly a 250% increase in kennels and workload while Center staffing increased only 100%. The new facilities attracted a greater client base, leading to more animals turned in, redeemed, and adopted. More people are now coming in to adopt and relinquish pets, obtain information, more veterinary care is needed and provided, and more volunteers and trainers want to help. This is exactly the business of LA Animal Services, and it is all being managed with a minimum workforce. As the Department moved into its new Centers we encountered a learning curve for effectively managing our new facilities and our enlarged shelter populations. As the new Centers began to open in late 2006 we realized in 2007 the lowest euthanasia rate (15,009) in the department’s long recorded history of statistics gathering (since 1960. Over 110,000 dogs and cats were euthanized in 1971). 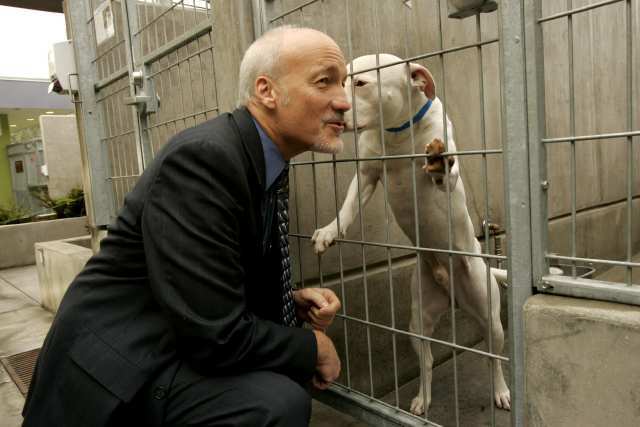 The low euthanasia rate in 2007 was the result of many reasons, but most notable was our having more space to hold animals coupled with a robust adoption program. In 2008, as we were still moving into our new Centers, we experienced a 20% increase (54,191) in intakes due in large measure to the economic downturn. This increase was complicated by our inexperience managing so many animals in all this new space. Consequently, the shelters quickly filled up (sometimes to the point of overcrowding), animals got sick more often and we sometimes found ourselves forced to resort to euthanasia to bring populations under control again. The nearly 30% increase in adoptions in 2008 did not keep pace with our 20.5% increase (nearly 150 dogs and cats every day) in intakes. LA Animal Services had to quickly find its balance in an environment of severe budget cuts, unprecedented demand for expansion of services, and a severe staffing shortage. The Department had to re-group, tone-up and empower staff (especially at the mid-management level) to improve accountability and effectiveness. Having gone through this painful growth experience, our Center Managers are now constantly looking for ways to better promote their adoptable animals more effectively. They are on the lookout for more and better off site adoption partners and events. The Department is exploring partnerships with pet stores interested in abandoning puppy mill sources. Our veterinarians are spaying or neutering some animals in-house. This allows our adopters to take their new pets home on the day of adoption. And our Veterinary team is implementing an enhanced cleaning regimen designed to help maintain a healthier shelter population. We are aggressively transferring animals to one or another of our six adoption Centers or another municipal or private shelter when appropriate to increase adoption options. We’ve developed and are strictly adhering to a Population Assessment Management program that maintains our Center populations at least 10% below maximum capacity to allow sufficient space for incoming animals. Another significant innovation that we are in the process of implementing is a program called, “Heart-to-Heart”. This program focuses on animals in our Centers longer than two weeks. Each Center has a Heart-to-Heart team that includes the Center Manager, the Center Veterinarian, the ACT Supervisor, and the New Hope Coordinator or their designees. This team works together to help decide the best options for animals that don’t get adopted in their first two weeks in a shelter. The team is charged with considering and exhausting all avenues of release, including but not limited to mobile adoption events, New Hope and other marketing pleas, transfer to another Center or agency, etc, etc. So, are these strategies responsible for the positive statistics below? Time will tell. The Department will continue to monitor, tweak, manage, and modify as we continually learn from our mistakes, our successes, and the counsel of others. Intakes/Rescues: February 09 Intakes were up over 7% (from 3,010 to 3,225). This is the highest February Intake since collecting data electronically began in 2001. February 2001 Intake was 3,079. Year to Date (YTD) Intakes are up over 4% (from 6,275 to 6,542). This is the highest January/February Intake since 2001 when 7,034 animals were taken in. This is a disturbing trend continuing from 2008. Adoptions: February 09 Adoptions are up nearly 18% (1,607) compared to February 08 (1,377). YTD Adoptions are up 17.6% (from 2,848 to 3,351). New Hope: February New Hope Placements are down nearly 7% (from 329 to 306). YTD New Hope Placements are down just over 10% (from 714 to 638). Return to Owners (RTO): February RTOs are down 2% (from 376 to 368). YTD RTOs are down 6.5% (from 793 to 741). Euthanasia: February Euthanasia is down 11% (from 748 to 665). YTD Euthanasia is down 14% (from 1,568 to 1,345). This is nearly 3% lower than the historic 2007 low of 1,384). Again a sincere Thank You to all our employees, volunteers and partners for all their efforts to help support these life saving strategies.